People in Hungary have been warned to prepare for their country’s worst floods ever as the Danube is set to reach record levels this weekend. “We are facing the worst floods of all time,” said Prime Minister Viktor Orban. Europe’s second longest river is set to hit unprecedented levels in the capital Budapest in the next few days. A state of emergency has been declared, and thousands of volunteers worked overnight to reinforce the banks of the swelling river. 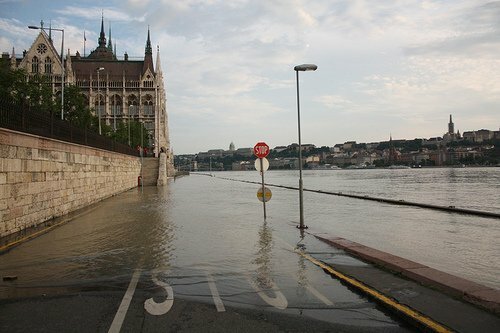 Water levels are set to reach reach 8.85 m (29 ft), some 25 cm (10 in) higher than the Danube’s previous record high in 2006. Emergency workers have set up camps along the river as residents packed sandbags around their homes amid an atmosphere of concerned expectation. Viktor Orban, who spent the night at a military barracks in the flooded western city of Gyor, said recent dry weather in Austria and Germany, as well as a hot forecast for Hungary over the weekend, gave reason to hope that Europe’s worst river floods for more than a decade could soon be over. The Danube peaked on Thursday in the Slovak capital Bratislava, where the main flood defenses held firm. In northern Germany, workers piled sandbags along the banks of the River Elbe as waters rose, after widespread flooding further south. As flood waters receded to the south and east, defense work continued apace near Lueneburg in Lower Saxony. Tens of thousands of people have been evacuated from at-risk areas in Germany, where the flooding is worse than that recorded in 2002. On Thursday the Elbe flooded parts of Dresden as it peaked nearly 7 m (22 feet) above its normal level, but the city’s historic centre remained unscathed. Upstream along the Elbe in the Czech Republic, emergency workers used boats to shuttle supplies to stranded people as large areas remained under water. Widespread flooding in central Europe has inundated swathes of Austria, Germany and the Czech Republic, killing at least 15 people.